MIM:This was posted on the MSA Philly Council website detailing how several "key UPenn administrators" perversely came to the terror tied MSA prayer services and offer support to the Muslim students in the wake of the San Bernadino Jihad massacre. It is during such a beautiful gathering that we can't help but feel overwhelmed with the support and solidarity people have shown us. In such a difficult time for many of us, we want to thank the University of Pennsylvania and their community for such a touching gesture and we greatly appreciate all of their support." In light of the recent hateful rhetoric that has circulated around our country on the topic of Islam, we wanted to write to you to express our personal dismay at these thoughtless and hurtful words, and to assure you of the absolute commitment that Penn has to providing a safe and welcoming environment for you to practice your faith and feel that you are fully accepted and embraced within the Penn community. We cannot state strongly enough that at Penn, everyone belongs. Please know that we will not tolerate any discrimination, intimidation or threats against Muslim students at Penn. You are an integral and important part of our community, and we want you know that the University is committed to offering you every opportunity to practice your religion, live your faith, and realize all the opportunities that exist for Penn students. We have asked our Chaplain and the staff in VPUL to reach out to you to ensure that we are aware of any difficulties you might encounter. Please let them know immediately if you are confronted with anything that you feel threatens your absolute right to express your religious beliefs. These are challenging and difficult times in the world. Please be assured that Penn stands with you and supports you. MIM:The terror tied MSA sheds crocodile tears over "the shooting in California". True to Islamist form they imply that Muslims will be targetted (in a non existent backlash) and despite being "deeply shocked and saddened by the events" "want to stress the importance of being vigilant". Our thoughts and prayers are with all the victims and families affected by the shooting in California. Nothing will ever justify hurting or taking the lives of innocent people. While we are deeply saddened and shocked by these events, we do want to stress the importance of being vigilant and extra cautious in these difficult times. We encourage everyone to follow basic safety precautions, such as being aware of your surroundings, traveling in groups, contacting public safety any time you feel unsafe. We also want to remind everyone that each campus has faith based support and counseling services to talk to if need be. If you are having troubling locating or finding someone to talk to, please let us know and we can put you in touch with someone. "...How did they let you through security?" the university president jokingly told him at her party, Saadi told The Daily Pennsylvanian. 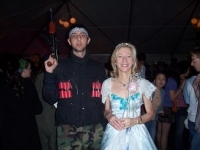 Saadi posted his photo with Gutmann on his Facebook.com profile in an album that included pictures of him and another friend masquerading as a "freedom fighter" preparing to execute victims as the other recites verses from the Koran..."
In 2007, a New York Police Department report characterized the MSA as an "incubator" for Islamic radicalism. That assessment was echoed by Former FBI Special Agent John Guandolo, who described the group as "a recruitment tool to bring Muslims into the Brotherhood," and the the "focal point" for the MB in America. "Their goal, both from their senior leaders, presidents of MSA's around the country, national leadership, is to implement Islamic government here in the United States," Guandolo explains. "And they say that." Such tactics are part of MSA's "Stealth Jihad," which consists of nonviolent initiatives whose long-term goal is the imposition of Sharia law over every region of the earth by non-confrontational means. Under the banners of "tolerance" and "civil rights," stealth jihadists introduce, in piecemeal fashion, elements of Sharia into Western societies and then demand that non-Muslims make allowance for those elements. MIM: The MSA at UPenn has openly declared that the purpose of interfaith discussions is da'wa. The Muslim Student Association is made up of American and international Muslim students who are concerned with safeguarding and nurturing their Islamic consciousness and sentiment. Through seminars, meetings, study breaks, and general discussions, the MSA seeks to serve the needs of the Muslim community at the University of Pennsylvania. Friday salat-al-Juma, id al-Adha, and id al-Fitr are all observed jointly. Other activities of MSA include efforts in the area of da'wah through interfaith discussions and the provision of articles, books, and pamphlets pertaining to Islam. Discussions with the general University community about social, economic, and political affairs in the Islamic world are also encouraged by the MSA. The MSA invites all those who have a genuine interest in Islam as a way of life to come and be part of its efforts. MIM: The Jewish Hillel group at UPenn also wrote a message of "love" and support" to the terror tied Muslim Student Association in a gesture of solidarity lest Muslims be made to feel bad by non Muslims in the wake of the San Bernadino jihad attack. It was published on the Facebook page of the Muslim student chaplain at UPenn. Over the past few days and weeks, many of us at Penn Hillel have been angered and saddened by the comments made by certain politicians running for the office of President of The United States. Blatant and unwarranted attacks against Islam is unrepresentative of what America stands for and has stood for since in its founding. As Jewish students who have also been seen as other in America and other parts of the world, we came to America in search of the ideals it preached, religious pluralism among the highest, and are severely wounded when those who claim to lead our country, or want to lead our country, are oppressors of this country's founding ideals. We wanted to reach out to express our pain with these comments that have targeted the Muslim community. This speech is not only incredibly harmful and oppressive to all Muslims, but also to all those who respect the ideals of liberty, equality, and peace. We pray with you for peace in our times, where religion is seen and is only providing the world with light in such dark times. We stand with you in solidarity as an ally when these comments are made. We are here for you and these negative sentiments are not shared by the leadership of Penn Hillel. We have personally interacted with your incredible community, and have always had amazing experiences. We are here as friends to comfort you and to stand beside you in the face of those who promote hate on this campus, in our communities, and in this country. Michael Mitzner - Outgoing Hillel President, Katie Hartman - Incoming Hillel President, and the entire Penn Hillel Student Leadership.